The Worldhotel Ripa Roma is a smart and modern hotel in the trendy and friendly area of Trastevere, 55 yards from the tram stop to the historic center of Rome. Free Wi-Fi is available.Rooms here are spacious and air conditioned. They feature satellite TV, a minibar and a private bathroom with free toiletries.Ripa Roma, part of the Worldhotel group, is in the modern part of Trastevere, right by the Ministry of Education. The area is connected by bus to Termini Train Station, and is very well-known with the locals for its many dining and drinking opportunities. The Worldhotel Ripa Roma (Formerly Ripa Hotel) is a Tourist hotel. Located in ROME area. Shopping is accessible by bus/taxi and the nightlife/restaurants are located in the hotel. 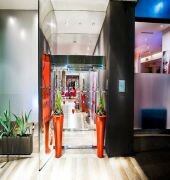 Descriptionclass="small" style="text-align: justify; font-size:11px;">The Worldhotel Ripa Roma is a smart and modern hotel in the trendy and friendly area of Trastevere, 55 yards from the tram stop to the historic center of Rome. Free Wi-Fi is available.Rooms here are spacious and air conditioned. They feature satellite TV, a minibar and a private bathroom with free toiletries.Ripa Roma, part of the Worldhotel group, is in the modern part of Trastevere, right by the Ministry of Education. The area is connected by bus to Termini Train Station, and is very well-known with the locals for its many dining and drinking opportunities.